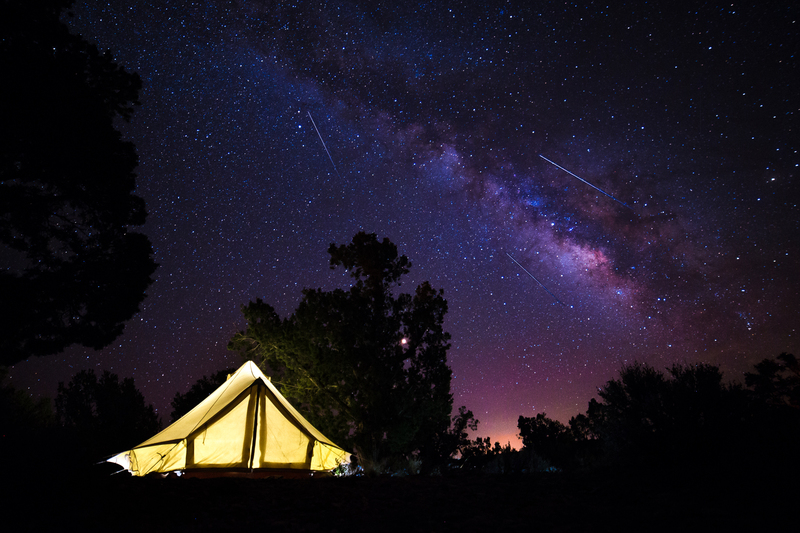 Last weekend I went glamping — glamorous camping — with Heritage Inspirations, a Taos, N.M. travel company whose excursions highlight the culture, heritage and stories of the people from this breathtaking part of the country. Angelisa Murray, Heritage’s owner and chief guide, plans her overnight trips around the arrival of the new moon, when the night sky is a pitch-black backdrop for the stars, planets, constellations, random satellites and, of course, the phenomenal Milky Way. We really lucked out. August brings the annual Perseid meteor showers and 2018 promised to be among the most spectacular in recent memory. What I didn’t count on was that the Perseids were not the most memorable part of the trip. What was? The connection made between six strangers — half a dozen people from diverse walks of life — who happened to converge on the edge of the Rio Grande Gorge for a brief time far from busy schedules, quotidian concerns and nagging devices. The two-day trip would have been spectacular even without the main attraction. We hiked the Gorge’s west rim; chilled out to restorative yoga; gorged on gourmet organic dinners; and even paddle boarded in the shadow of Georgia O’Keefe’s beloved Pedregal Mountain on Abiquiu Lake in Ghost Ranch. Our chic tents, more than six feet at their pitched peak, housed real beds with foam mattresses, down duvets and the softest linens, a night table featuring fresh flowers and a solar lantern, carpets and a butterfly chair. Our morning coffee was local, made with a French press, with plenty of half and half to top it off. But the part of the trip that really stands out in memory is that first night watching the Perseids fall to earth. The six of us gathered together on yoga mats, wrapped ourselves in colorful woolen blankets, and turned our heads expectantly toward the vast sky. Besides Angelisa and her husband, there was a writer from Los Angeles and a photographer from Michigan, who took the amazing photo above. We were joined by a young woman from the Taos Pueblo, who earlier took us on a tour of the Pueblo, a World Heritage Site. There she proudly pointed out the ceremonial kivas, the ancient adobe architecture and her grandparents home, where the family gathers during feast days. She came with her boyfriend, who works at the Pueblo governor’s office. It was so dark you could not even see the person lying next to you. But the sky! First, we saw planets. Definitely Mars. Probably Jupiter, which is as close to earth as it has been in a dozen years. The Big Dipper twinkled in the western sky. Further south Scorpio began to rise. It got even darker and the Milky Way became more dramatic. And then, well, the main attraction began. The first meteor I saw was low and bright as it streaked across the sky. We ooh-ed and aah-ed and grabbed each other each time one flashed by overhead. We called out their positions — “one o’clock!” — but they disappeared before we could turn our heads. Sometimes they fell together in a spectacular dance, one, two, three at a time. The best thing was that we were all right there, in the moment, laughing so hard, childlike, innocent and free. How often does that happen? Everything about the night was heightened; we were so present, so connected. All one: the stars, the sacred land and six lucky souls.